In collaboration with some Panamanian law firms, “offshore asset protection” outfits and real estate salespeople, plus another American named Daniel Daves, Wiles has prompted a migration to Boquete of Americans who believe in these primitive sorts of hatreds and are prepared to evade the immigration, labor and weapons laws of the Republic of Panama. 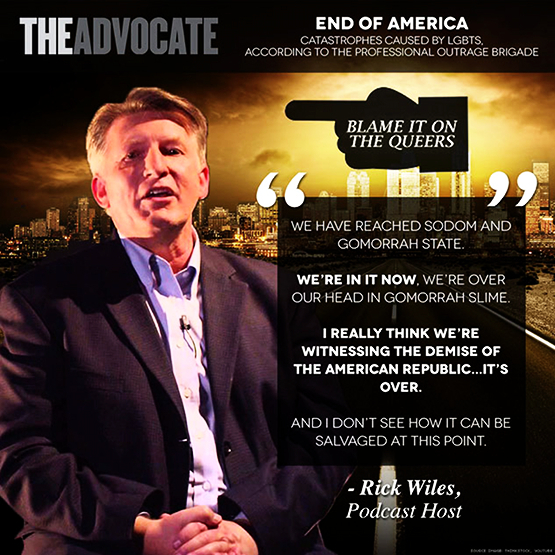 Quotations by Rick Wiles, graphic by The Advocate. Take the Wayback Machine to Panama City in 1856, when the California Gold Rush was still underway, the Dred Scott case was percolating in the American courts toward the next year’s decision that would do so much to provoke a bloody civil war, and this gringo named Jack Oliver thought it appropriate to steal from an Afro-Panamanian fruit vendor, and to introduce a gun into the argument when the vendor objected. Dozens of people, mostly Americans, were killed and the first of several US military invasions of Panama ensued. Fast forward to 2014. This gringo named Sage Million was one of the “sovereign citizens” who colonized the El Volcan area. The sovereign citizens have many variations on a rap that began with a white supremacist group that calls itself the Posse Comitatus (not to be confused with a US law of that name). That routine originally went that because the rebellious states of the old Confederacy were obliged to adopt state constitutions that ratified the 13th, 14th and 15th Amendments to the US Constitution as a prerequisite for readmission to the Union, those amendments and all US constitutional changes that came thereafter, and the very existence of the federal government. and the things that it does and has done, are illegitimate, null and void. Consider that the 13th Amendment abolished slavery to know how reactionary that is. Consider that the 14th Amendment provides among other things that every person born in the United States is a US citizen to know how reactionary Donald Trump is. But there are other strains of sovereign citizens who say that it wasn’t until the 17th Amendment in 1913, which provides for direct election of US senators, or the 1934 Gold Reserve Act, that the national government became “unconstitutional.” In any case, the sovereign citizen rap is that by the time that Hawaii became a state in 1959 everything that the US federal government did was illegitimate. That being so, Mr. Million figured, Hawaiian statehood and Hawaii’s state laws are illegitimate, ESPECIALLY the one giving rise to the warrant for his arrest for allegedly having sexual relations with a 10-year-old girl. He also considered himself so personally sovereign that Panamanian and Costa Rican borders didn’t apply to him. In the course of an illegal border crossing Panama’s SENAFRONT arrested him and the US embassy notified Panama of the state warrant for his arrest. Just one short-eye perv who’s a bit crazier than most? Well, that too, but Sage Million had both open and silent supporters in the gringo community here. That’s scary, because some modern-day Jack Oliver who considers that young cholas have no rights that a white gringo is bound to respect could rather quickly inflame the deadliest of passions. A mob enraged about something like that may not inquire about what sort of American they would be attacking, especially if the ultra-right element of the gringo community shoves its way in front of the TV cameras and represents itself as the voice of all Americans here. 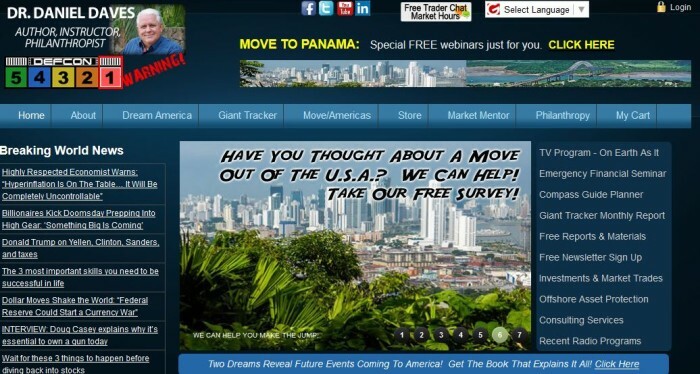 So is it just a matter for amusement when dozens of American families heed a call by Rick Wiles and Daniel Daves to drop everything in the USA and head to Panama, and then they start to show up in Boquete? Consider that they are not just urging senior citizens to come retire here. Many of the people who have come to Boquete due to the urging of Wiles and Daves are working age Americans who are not millionaires and won’t qualify for pensionado, investor or special professional visas. They are coming here intending to violate Panamanian labor and immigration laws. And what about the advice that Daves gives his followers about protecting themselves? He not only says that every “Christian” of his variety ought to be packing a gun, he’s advising people to get portable anti-aircraft weapons to shoot down drones. Panama is conflicted about gun policies at the moment, and perhaps our Security Minister Rodolfo Aguilera is so far off the deep end as to like the idea of foreigners who are illegally here carrying surface-to-air weapons around. Were the National Police interested in a military coup, that sort of thinking around the cabinet table would be a readily available excuse. But although I think that Aguilera gets his information from Hollywood fiction to an extent unacceptable in a Panamanian government minister, I don’t think he’s for gringo fanatics going around Panama armed with weapons of war. But hey — just because Panamanian law provides that preaching ethnic, political, racial or religious hatred is a deportable offense if a foreigner does it, our gay, lesbian and transgendered citizens are “fair game” here. In Panama it’s “legal” to hate queers. Plus, one of the questions that is not looked into during this country’s immigration procedures is whether the applicant suffers from paranoid delusions. Set aside all of the creepy xenophobia that comes from legislator Zulay Rodríguez’s mouth — but all resident gringos should be aware of the threat that it represents in the presence of American extremists in Panama. And for those of us who are citizens, whether or not duals like me, there is a duty to Panama’s sovereignty — not only from hostile nations but also from individuals who consider themselves to be sovereign powers superior to the Panamanian people and to the flawed republic that happens to be the only one we have. Balance those things against the universal human right to believe in whatever stupid thing that you want to believe. It’s not the first occasion for Panama to balance such considerations. But I think that if Wiles or Daves are found in this country, they should be arrested for illicit association to violate a number of Panamanian laws, and that all of their followers who have come here or seek to come here should be carefully examined on an individual basis. Panama really needs a better defined and more consistent policy about these sorts of colonizations.